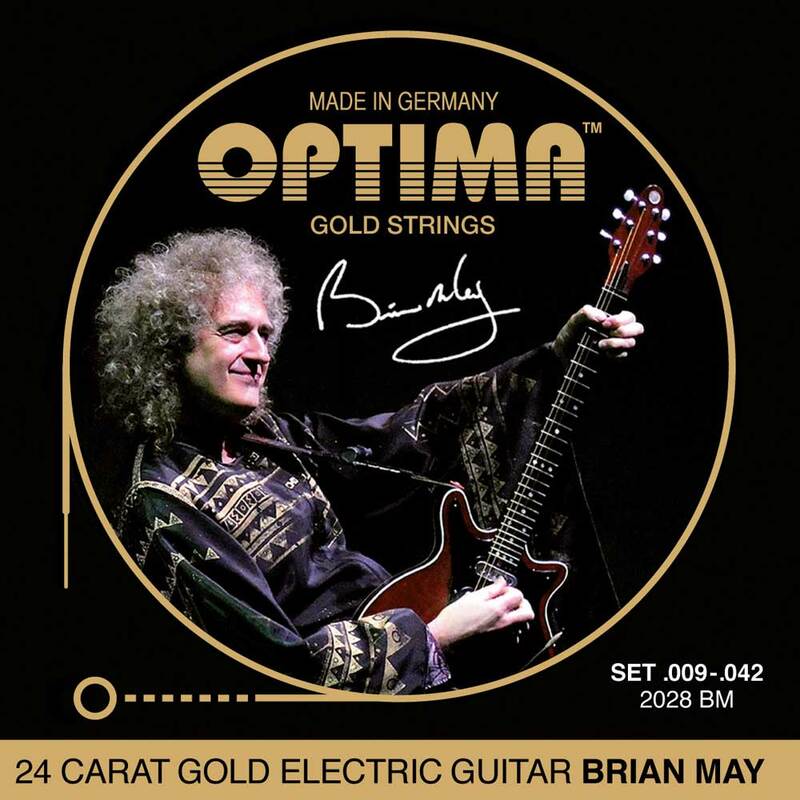 OPTIMA 24K GOLD STRINGS BRIAN MAY - How would probably sound his hit songs, ifBrian May used conventional guitar strings? But he has decided for theSOUND OF GOLD and Optima is proud that these strings have made, and still make, a small contribution to Brian May's great success. BRIAN MAY Signature is acoordinated set of Brian, which was developed specifically with him and for him. But also the best strings can become better. The BRIAN MAY GOLD Strings now have a new core material which ismore tearproof and which improves the tuning stability significantly. A highlight of the art of making strings! OPTIMA GOLD STRINGS are probably the finest string in the world. Developed and handmade in Germany from the finest materials and for highest tonal demands. This series reflects the 90-year tradition of string manufacturing. The result is a string of unmatched premium quality.All strings are coated with real 24 carat goldand are therefore completely insensitive to tarnishing or corrosion. Their durability is, compared to normal strings, up to three times higher and they are suitable for people allergic to nickel. GOLD STRINGS are characterized by a brilliant sound and the typicalSOUND OF GOLD. The best strings ever!!! I cannot believe the first time I'd try them: these strings last forever!!! And the sound is awesome. Also the gold strings looks cool on any guitar. It's the only strings I buy for all my electric guitars.